Is there any chance for this to work. I just vaguely remember those water towers in Warcraft 3, and hints of hydromancy. 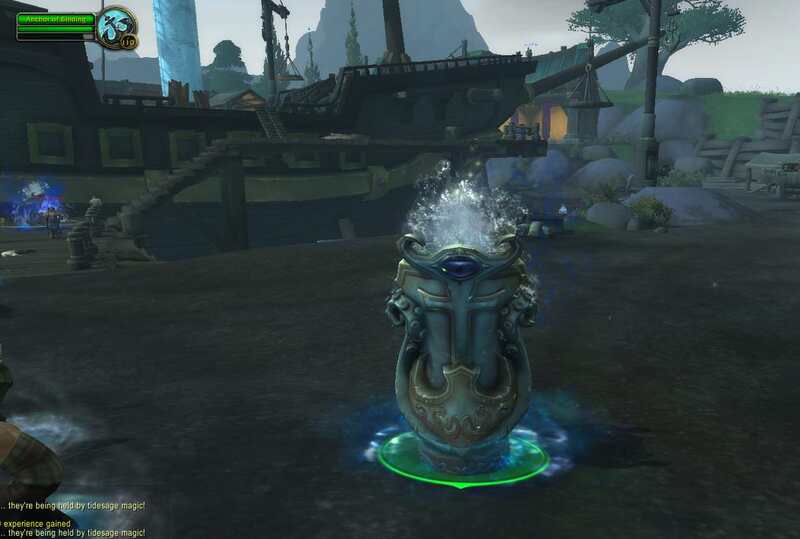 Could there be any resto shammies communing with water and the elements on Kul'Tiras, or is it all just Jaina/Dalaran style bending elements to their will with arcane? "There is another person on the other end of the chat screen. They're our friends; they're our brothers and sisters; they're our sons and daughters. Let's take a stand to reject hate and harassment, and let's redouble our efforts to be kind and respectful to one another, and let's remind the world what the gaming community is really all about." I actually feel like it’s more fitting then Kul’Tiran druids. The Tidesages definitely feel Shamanistic to me, although I think they are functionally Mages or Priests - they have command over the seas but can extend to that "all of the elements," they can summon/control elementals, and generally approach their reverence for the sea much the way Shaman do the elements. The Tidesages also appear to worship the Tidemother, which is either a powerful Elemental noble or possibly an aquatic Wild God. They would be shamans. Imagine spellcaste who uses water and storm magic to win a naval battle. Hydro = water, so it is better fitting for resto shamans. Someone who use frost magic is a cryomancer. Even though a frost mage is like a mix between the two due to the water elemental they use. Realistically, both the Zandalari and Kul Tirans should be all classes except heroic ones (Death Knight, Demon Hunter). Kul Tirans could even be DKs without too much lorelol, but we know Blizzard is not going to do that. I would actully agree with this. Kul Tiran can't be paladins because they have different mindset and worship sea instead of light. What's water made out of again? If you ask DW on Arthur, h2O stands for hose + oxygen. Air + hose makes water! I agree. Kul Tiran shamans seem to be a better thematic fit with the Tidesages and the centrality of the sea and storms to their religion. The druids feel tacked on to counter the Zandalari getting unique druid forms. Also, Zandalari demoniacs are demon hunters. They should give us Kul'tiran shamans and Zandalari paladins. Not insofar as we've seen. Those objects are actually stationary censers in which the Tidesages seem to store watery magical essence, like ritual batteries of a sort. I do agree that that they have a lot in common with shaman, though. a hydromancer is a shaman. They had more simplified model before (just iron anchor) and then were replaced with this new model. I say KT shamans are confirmed at this point. Since TBC, i still wish to see shaman class not be gimped down (so they would be only useful as healers);dreaming about ench shammy with 2hander ... not these pathetic dual weild noodle. Balance around shamans always feels weird , couz main races that most ppl plays cant be shamans (Belfs,Humans),so shaman class all the time left to outcast (dwarf female,weed trolls,cows who failed to pick pally or warrior) so i hope if Zandalari and K.humans would be shamans Blizzard will OPEN eyes and make them little bit competitive. God they even went so far as removed "Gust of wind" devil knows why (my favorite skill of shaman in LEGION). Now shaman ONLY class in game who has only 2 defensive cooldowns, compered to others 4-8 per class =freaking shame.